Highlights from the latest U.S. Mint sales report include first showings of four collectible products. Each of them performed well in the early going, leading the sales charts. In summary, the Mint last week released a 24-karat gold coin, a set with 13 proof coins, a set of uncirculated dollars featuring Richard Nixon, Gerald Ford and Ronald Reagan, and a set with uncirculated quarters commemorating national sites in Illinois, Kentucky, West Virginia, North Dakota, and South Carolina. The Mint’s top weekly seller was the 2016 Proof Set with its 13 coins for $31.95. Collectors ordered 185,624 in three days. An earlier article, right here, compares its debut to those from past years. Second most popular was the uncirculated set of 2016 Presidential dollars for $14.95. It registered 6-day sales of 23,091 for the quickest start in the annually issued product line since 2010. That year’s set opened with sales of 23,962. Last year’s release wasn’t too far behind, debuting at 22,150 sets. The U.S. Mint continues to offer sets from 2011, 2014 and 2015. These now have sales totaling 84,758; 61,090; and 54,276. The sets from 2012 and 2013 sold out at 99,743 and 75,846. Third on the popularity list was the 2016 America the Beautiful Quarters Uncirculated Set for $12.95. It pulled in sales of 14,250 in five days. Last year’s set opened at 12,593 and the set from 2014 kicked off with sales of 12,085. This year’s set is the seventh released. The Mint is still selling all but one of them, with the set from 2012 selling out at 42,223. Those from 2010 to 2011 and 2013 to 2015 have sales of 40,969; 39,698; 41,850; 28,770; and 25,417. Even at its higher $1,590 price, the 2016-W $50 Proof American Buffalo Gold Coin ranked fourth best by scoring 4-day sales of 12,001. As also discussed earlier, the start was the quickest in the series since 2010. The U.S. Mint published sales updates to 253 numismatic products. Ninety-two of them outperformed their prior weekly sales compared to 160 previously. Ten of them increased by more than 1,000 units compared to 9 previously. Four had their sales reduced compared to 5 previously. Below are tables showing the latest sales for U.S. Mint numismatic products. The sales period covers Mar. 28 to Apr. 3. Products with an asterisk (*) are no longer available. 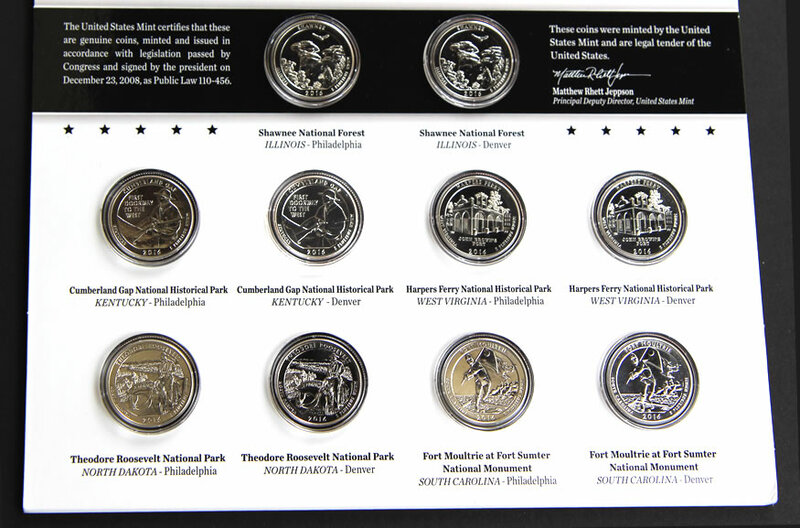 Interesting that only 9, 270 of the “2016 NPS Three-Coin Set” have been sold so far. I am surprised too at the low sales of the MT $5 gold coins & NPS $5 gold coins. Very low so far! I was just looking at the ATB P version of the Shawnee on the Mint’s website and I noticed in the specification area that there is no indication of what kind of a finish it has. I have a 2013 P version in OGP and I was looking at the COA and it says “Quality: Uncirculated” … Did the Mint drop this description in it’s COA later on? (I haven’t any later P 5 oz. ATB with OGP/COA so I am not sure) But any clarification from your part would be helpful and clear up my confusion! Tinto, the Shawnee’s COA is like past years, stating “uncirculated” for the finish. While the U.S. Mint’s COAs for these coins does say “Uncirculated”, the Mint further describes the special finish on the “P” Mint mark versions of these ATB 5-oz silver coins as a “vapor blast finish.” The third-party coin grading services like PCGS & NGC distinguish these special finish coins by calling them “Specimen” finish with grades on the holder labels as “SP-70” “SP-69” etc. versus the bullion versions that they grade as Mint State (MS-70, MS-69 etc). Thanks, guys. But the Mint’s own website does not give a finish description in the Shawnee 5oz P version, which to me is kinda strange since like you guys said, they’ve been making a big thing out of this special “vapor blast” finish but now I don’t see a mention of it in their product specification web page. Below is a copy and paste …. The U.S. Mint doesn’t always put every detail on its website for some strange reason, but does issue press releases that explain the special finish on these coins. If you Google this phrase “U.S. 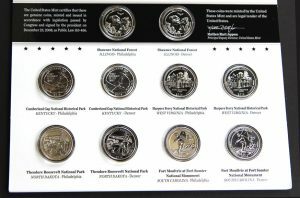 Mint 2016 vapor blast” it will bring up an article dated February 12, 2016 by Coin World newspaper that the Mint responded to about the new Shawnee 5 oz “P” coin & all such vapor blast finish coins. You are welcome. Those coins & sets you listed are 3 U.S. Mint products I look forward to this year also. The TR puck will be very popular for sure! Like you, I am purchasing less from the U.S. Mint in the last 12 months & purchasing more foreign Mint coins with very low mintages. If your buying the 2016 U.S. Presidential $1 coin proof set, check the coins carefully as I had two of the coins which had spec marks. I have a Gettysburg quarter The monument is gold the rest of the coin is silver does anyone have any info on this.